A dog has been rescued after spending nearly a week on a floating sofa after her home was submerged by Hurricane Florence. 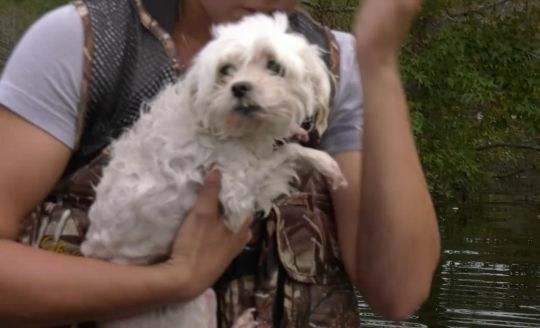 The family dog was saved from neck-high water by rescuers from Humane Society of Missouri (HSMO) after it was left abandoned in severe weather that has killed 37 people in Carolina and Virginia. 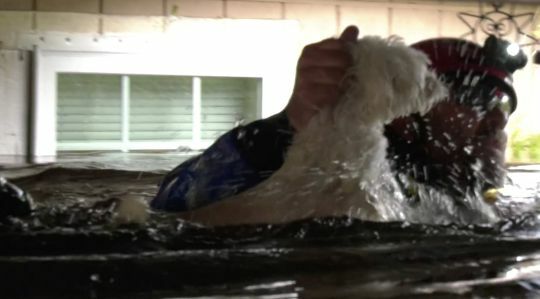 In a video, one rescuer can be seen kicking in the door of the home as another grabs the white Maltese named Soshe, who then starts swimming for its life. Paddling towards the rescuers, Soshe could be heard barking in relief before clambering into the arms of her saviours. Soshe had used the sofa as her life raft for almost a week. Watch the video on link below.